I didn't make any major changes, just a few small things. 3. made the mountains purple like they were on Kap's version. 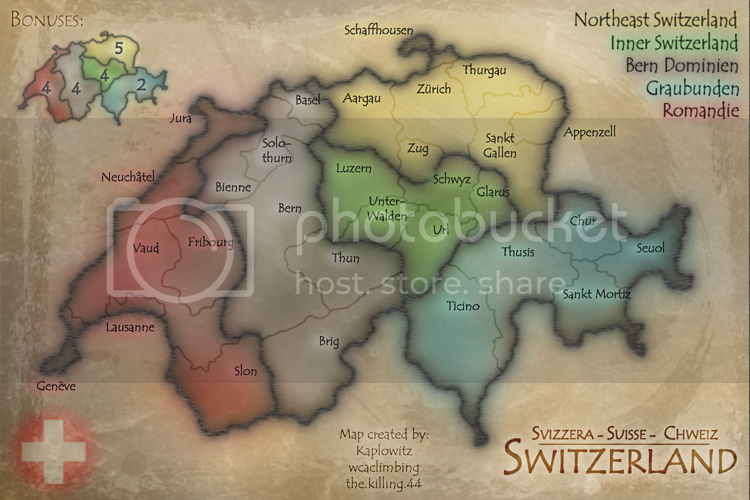 change "North-East Switzerland" to "Northeast …"
Last edited by wcaclimbing on Mon Apr 20, 2009 4:23 pm, edited 73 times in total. Very open map at present. I assume you're intending to add a few mountains in a country that is inundated with the Alps? The graphics otherwise are a good start. I was thinking about adding mountains, but where? I dont want to add them just for the hell of it. have a look at positions of mountains in switzerland on websites, then add them in corrosponding positions, although they probably would go through and cover some whole territories, you cant be 100% accurate. definitely immpassables as others have stated and you probably have also planned. i dont know much about switzerland, you could do some research into what kind of public transport they may use, i know that their trains are very accurate and very good, so you might want to include a train system to link some terits, or an underground system - like tube in london - and subway in the US. I also dont know about how many airports there are so i cant comment about linking terits with airports. Last edited by t-o-m on Tue Apr 08, 2008 9:19 am, edited 1 time in total. wouldn't everyone who played it get an overwhelming urge to make a peace treaty with their neighbours ? why do you have 30 terts ? there are 23 or 26 cantons depending on whether you count the 3 sets of Halb-Kantone's individually or together. Last edited by greenoaks on Sat Apr 05, 2008 12:39 pm, edited 1 time in total. greenoaks wrote: wouldn't everyone who played it get an overwhelming urge to make a peace treaty with their neighbours ? t-o-m wrote: have a look at positions of mountains in switzerland on websites, then add them in corrosponding positions, although they probably would go through and cover some whole territories, you cant be 100% accurate. i dont know much about switzerland, you could do some research into what kind of public transport they may use, i know that their trains are very accurate and very good, so you might want to include a train system to link some terits, or an underground system - like tube in london - and underground in the US. I also dont know about how many airports there are so i cant comment about linking terits with airports. If you want that true Switzerland feel, then sure! Mts good or too shiny? Are they in a good spot? still fairly open, thats ok though. mountains are orange? why? they're not too shiney though. i havnt taken a look at the bonuses because i cant see the whole image and i cba fixing my screen resolutions..
the map is a little dark, you could perhaps make it lighter and hold a poll to see whether people prefer lighter or darker. what is this widow makers' bonus maker tool? t-o-m wrote: still fairly open, thats ok though. They were meant to be brown, i will fix that. http://www.conquerclub.com/forum/viewtopic.php?f=10&t=1410 here are the map making tools, its on that list. The mountains are a good start. Yes, dull their orange-ness some, but I like the direction this map is going. they look a little bit..."rusty". i dont think thats the colour to use, maybe try a little less red in them, reduce the R in the RGB menu and browse some colours there. sry guys, cant really get on except for weekends. Ill change the red thing above, and keep the comments coming! IE: Internet Explorer. I usually use Firfox. This map looks like it has a lot of promise. My biggest suggestion now would be to do something with all that gray space in the background. It doesn't even need to be anything fancy - maybe just a subtle texture, or maybe draw in the borders of neighboring nations and put their names, or something. It just looks a tad boring now. again if you go to the RGB chart and reduce the G factor by a little bit this can be solved, it might just be my monitor, what do others see? I will do the above things. Kaplowitz wrote: I will do the above things. whats not with those things! i like em! when is your next update going to be?